KUCHING: Malaysia is at the forefront of the global Islamic tourism industry, which is steadily expanding and estimated to be worth USD220 billion (RM950 billion) by 2020. Deputy Tourism and Culture Minister Datuk Mas Ermieyati Samsudin said apart from international recognitions, Malaysia has also become the point of reference for many countries in their development of the Muslim tourism sector. “Since 2011, Malaysia has been recognised as the top holiday destination for Muslim tourists from around the world. “Tourism players from around the world referred to Malaysia when developing an Islamic tourism framework in their respective countries. 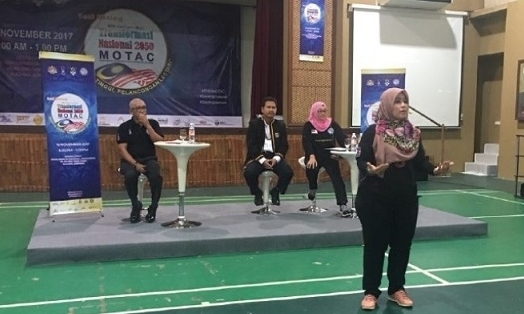 “With an estimated 1.6 billion Muslim population globally, many countries are trying to emulate Malaysia in their bid to capture the halal tourism market,” Ermieyati told reporters after opening the ministry’s National Transformation 2050 (TN50) dialogue at the Dayak Bidayuh National Association building here today. Present were the ministry’s deputy secretary-general Nor Yahati Awang Awang and Sarawak Tourism Board chief executive officer Datuk Ik Pahon Jiyok. Earlier this year, Malaysia was named the most popular destination for Muslim travellers for the third year at the MasterCard’s Global Muslim Travel Index (GMTI) 2017, which was co-published by a leading authority in halal travel and tourism, CrescentRating. Malaysia was also named as the top destination for Muslim travellers for four consecutive years from 2011, according to an online survey also by CrescentRating of Singapore. Several criteria were taken into consideration in the survey including the availability of halal food, access to prayer facilities, Muslim friendly services in hotels as well as the country’s security and stability. “We must not be complacent and continue to sustain this momentum. “At the same time, we must continue to share our knowledge and expertise with other countries. “The ministry has also established the Islamic Tourism Centre as the government is serious in developing this sector,” she said. On today’s event, Ermieyati said this is the fifth TN50 dialogue organised by the ministry for the tourism and culture cluster. “We want to hear the aspirations of the people in Sarawak. We believe they have a lot of things to say not only on tourism but also on the preservation of our culture in the next 30 years,” she said.